The story keeps referencing what happened in Blackwater before the game started tons of times. It felt like there'd be some sort of closure or return-to mission. Did anyone in the story actually say what happened other than Dutch shot some woman? Having the characters frequently talk about the lost money and Author's questions to what happened there only to never have at least a mission about it feels sloppy. Even John seems indifferent wandering Blackwater without thinking about what happened there with Dutch. Relax, he doesn't really spoil anything plus I know there's rules about spoilers on here but the game's been out for a month. None of this is really new information either, he's just frustrated about the fact that questions we were wondering about in RDR1 weren't answered. I didn't like that either. I think the game intentionally left it as a bit of a mystery since Arthur wasn't personally involved in that job. The player only knows what Arthur knows, which is 2nd hand information. It was a mystery 8 years ago. RDR2 at least promised closure and answers. It didn't. I get that some mysteries, particularly of the horror and sci-fi variety, are best left unanswered. But this is a major plot point that became even more muddled in RDR2. There should be no reason that a whole lot of somebodies shouldn't have a definitive answer about the deets of a ferry robbery gone horribly wrong. It ain't rocket science; it's a robbery. I don't think it really matters. We know how Dutch's plans go wrong because we see it happen multiple times in missions. Undoubtedly, they got into a shootout; they had to run; they stashed the money somewhere safe in a moment of desperation and in case they got caught; then they skipped town. It's a little harder to put two and two together with respect to the woman, but fair to assume that she was a hostage Dutch was done with, or a woman being held up that he blasted in a moment of losing his sh*t (which is also something we see later, a few times). I think people really overstate just how much and how interesting of a mystery this is. We know the significant bits already: robbery on a ferry that went wrong, a woman was killed badly, the money was stashed for safekeeping and the gang ran off. The rest is detail that could already be guessed. I do think it's strange though that the subject of the money doesn't come up when the epilogue finally takes you back. John was in Blackwater, you'd think a mission where you go looking for the stash would be in order. It's a big mystery because Rockstar hyped it as one, across 2 entire games developed 8 years apart. In addition to "Who TF Was Heidi McCourt?," "Why Did Dutch Murder Her In Cold Blood?," and "Where's The Money Stashed?," there's that other biggie: "Who TF Do All These Corpses Belong To?" The official article on the Blackwater Massacre lists 19 cops dead....hell, that's tame compared to the body counts Arthur racks up all across the land. Wasn't that the money John found on top of Mt. Hagen? I thought Micah had retrieved it earlier, and that's how he and dutch got back together. I'm assuming the other 19 were allies, loose hangers on of the gang, and hired guns. But Heidi McCourt's name comes up so often (particularly with the Strange Man) that one would think she held some significance. But then, maybe that's the point... they never really give her a second thought. John was THERE and doesn't even remember her name. Young mother of 2 gunned down, and nobody seems to have an ounce of remorse. That may be why the Strange Man brings her up. Pointing out that John may not be the good, honest man he thinks he is. But then he also tests John's moral compass repeatedly. My understanding was that it was micahs idea to rob the boat and it went horribly wrong. Seems there was a lot more armed guards than they expected, so maybe even a set up? Dutch comments to Arthur saying he should of been there and they could really of done with his help. Why Arthur wasn't there we will never know either. I kept hearing about cut content of Arthur, Hosea, and Charles scouting the land or something during a chapter that takes place before the failed robbery at Blackwater with them in New Austin. Since I think Charles also mentions he wasn't at the robbery so it sort of checks out of there's any truth to this. Can someone confirm any of this? Or shed some light on it? All I know, is Blackwater was a HUGE let down. Same with New Austin. I was expecting a decent sized city, maybe bigger than Saint Denis the way they bragged about all the money they took and trouble they got in. That town was no bigger than Rhodes... And New Austin... Nothing there but herbs, pelts and an annoying Sheriff. I don't see a third playthough in my future. I am only playing through a second time to get all the missed timeline features and piece it all together again. Don't get me wrong, I love the game, but Blackwater was a joke. The whole gunned down instantly thing for entering a small town like that... yea right... I'd expect more resistance from Valentine. If I didn't know any better it sounds like you never played RDR1? In that game Blackwater is an example of the civilized world taken over and the wild west being dead with the exception of the New Austin being truly the last remnant of the wild west. It's in Arthur's journal and in his convos with Hosea; particularly the one where they go bear hunting, IIRC. Apparently, the rift between Team Arthur and Team Dutch was already beginning in Blackwater shortly before RDR2 began. Micah was the one pressing for the raid on the ferry. Meanwhile, Hosea, Arthur and Charles were scouting another easier score in Blackwater involving a real estate scam. Dutch went ahead with Micah's plan, and agreed to let Hosea and Arthur carry out their scheme the next day; the latter two would then rejoin the gang and they would ride west into the desert, and on to California. Of course, it all went to sh**. Oh okay that's great. I remember the part about Hosea specifically talking about a good lead they would've followed up on. So I'm guessing Arthur, Hosea, and Charles were notified by some of the gang stopping by at a camp somewhere and told them to pack up and leave? No evidence at all that Dutch had "allies, hangers on, or hired guns" at the Blackwater ferry robbery. And they certainly weren't Dutch's Gang, or else they would've been mentioned in the tally of the dead, alongside Jenny, Mac, and Davey. My guess is they were hired guns, all right, but hired to protect the cash. Although not specifically stated, there's a good chance that the cash money -- $175,000 -- belonged to Cornwall, and he was getting ready to invest heavily in bringing Blackwater into the modern era. Especially in bringing trains with the name "CORNWALL" painted on their sides. So Micah's poor research wasn't counting on a small private army of thugs and goons guarding the boat. And just for the record: I think that boat was named the "Serendipity." No proof, just a hunch. But it would explain a LOT, and tie a lot of loose ends together. Not entirely sure of the exact timeline of the botched robbery, but apparently Dutch's gang had time to secure the safe, shoot their way off the boat, and make it back to their safehouse -- either in town or nearby outside, not sure which. So that's probably when Hosea and Arthur met them and had to skedaddle with the rest of the gang, with the Pinkertons and bounty hunters hot on their trail. I did... years ago. YEARS ago. The Blackwater job is the "Noodle Incident" of Red Dead Redemption 2. It's a sort of literary device named after an event that happened in the Calvin and Hobbes comic strip. This description sums it up pretty nice. "The Noodle Incident is something from the past that is sometimes referred to but never explained, with the implication that it's just too ludicrous for words—or perhaps too offensive for depiction—and the reality that any explanation would fall short of audience expectations." I'd buy into that if the characters treated the Blackwater Massacre as some sort of Thing We Shall Not Speak Of. But it's just not that horrific, not that different from any of their other heists, botched or no. It's not something that requires a lot of mystery or mystique. The gang tried to rob a riverboat, greatly underestimated the security presence (probably because it was Leviticus Cornwall, whom they had not yet had the honor to meet), got shot up pretty bad and were forced to flee into a full-force blizzard. It's just bad intelligence, clearly on Micah Bell's part; then Arthur and Hosea adopt a sort of "now see, if we had just gone with our plan instead, none of this would have happened" attitude towards Dutch, which started the rift. Then, as Team Arthur and Team Micah slowly widened that rift, Dutch struggled in vain to close it. But the point is, there's no great maguffin there. Nothing that justifies all the secrecy. A simple flashback is in order. Again: it shouldn't be that big of a deal. Rockstar gives more weight to the incident than is needed. This is so true. I was excited to see the Blackwater incident actually happen when I first started up the game. Noticed it just starts after. I thought alright maybe they'll use a flashback scene at least but it never happened. I can see why Rockstar didn't show it at first since they wanted to keep the whole doubting Dutch thing a mystery as to whether he's losing his touch and revealing his true self and all that jazz. But they should've at least had a flashback level where we play as John during the robbery. Hell even a cutscene would've been nice and showing Landon Ricketts in a cameo because apparently he was present at the massacre? I was super disappointed and I think it was a missed opportunity to not show the Blackwater robbery in any way, shape or form. <i> C U, you filthy shoe thieving shoe thief! It was an old game that I don't remember the name of. Then you're probably missing out on a lot of useful info even in spite of the fact it wasn't the same exact story. Rockstar probably made this so that this would be a point of discussion/speculation after the game came out. The Heidi McCourt murder was probably mirrored by Dutch himself with that girl he shot inside the Blackwater bank. Not much story into it, a standard shock value message. That one in the bank didn't surprise anyone, the other on the ferry in 1899 apparently did. Dutch showing a new coldblood and that. I agree a flashback of it would be nice. Movies and sitcoms do that fine. It's all basically the robbery from Reservoir Dogs - an inciting event that they omit because the specific details are actually not that important to the story. As for all those dead outlaws, I think that is probably the result of them setting up blanks in RDR that they never intended to fill in. Were they supposed to be members of the gang? (Probably not - Dutch's involvement is only suspected afterward.) Hired guns, or a rival outfit? Landon Ricketts was a survivor but not a gang member... It's compellingly mysterious, but in a way that suggests they may not have had a good answer in mind. They just needed a really big number of dead so that the story would make an impression. 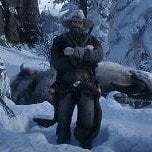 The RDR2 descriptions of it given by the surviving members seem a little like a retcon too, as nobody mentions any other outlaws at any point. Then why in that game I mentioned did they have a bank robbery at the end and the point stressed before the mission was not to harm innocent people or bystanders. I wonder who that could have been? lol It's like the blind leading the blind around here. R* was right on by pointing out that the "I" is one hell of a demanding thing. Your ability to put something right before everyone's eyes and them not see it is aces in my book. ...best in the business IMO. User was temporarily banned for this post: if you have a point, this isn't the way to make it. I think the split between players on this subject is like the difference between people who want to see the monster in full detail in a horror film, and those who prefer it stays obscured in the shadows, letting their imagination fill in the blanks - I fall into the latter category. Yes, on paper the Blackwater story, or what little we get from it, doesn't sound all that different from the gang's other escapades. But, to me, the fact that a harden criminal like Arthur was clearly rattled by that incident makes me think it went down is a lot worse than it sounds. So, what I've imagined in my mind to be something that was so cruel, botched, f*cked up, etc. that Arthur Morgan was rattled by it is far better than it would be if they just spelled it out. But that's just me, I like it when certain things are left to the imagination in storytelling. There is no right or wrong answer on how the Blackwater incident should have been handled. It's just preference. And what a flashback it would be. 19 lawmen dead, 22 outlaws, the streets of Blackwater littered with corpses, the whole gang riding out, guns blazing, into a blizzard, with an army at their heels? Jeebuz. I WANT. I think the split between players on this subject is like difference between people who want to see the monster in full detail in a horror films, and those who prefer it stays obscured in the shadows, letting their imagination fill in the blanks - I fall into the latter category. Yes, on paper the Blackwater story, or what little we get from it, doesn't sound all that different from the gang's other escapades. But, to me, the fact that a harden criminal like Arthur was clearly rattled by that incident makes me think it went down a lot worse than it sounds. So, what I've imagine in my mind to be something that was so cruel, botched, f*cked up, etc. that Arthur Morgan was rattled by it is far better than it would be if they just spelled it out. But that's just me, I like it when certain things are left to the imagination in storytelling. Arthur wasn't "rattled" by the incident at all, since he wasn't there. Nor was Hosea. But the fact that neither Dutch nor anyone else wants to simply explain WTF happened causes them to start doubting Dutch. Like, dude, we've ridden together as the Three Amigos for 22 years, and now you can't confide in us a simple debriefing on a big score that went wrong....? Hell, if I was Arthur or Hosea either one, I would've been pissed and ditched Dutch (ha) until he came straight with it. What kind of psychotropic babble is all this about, again...?